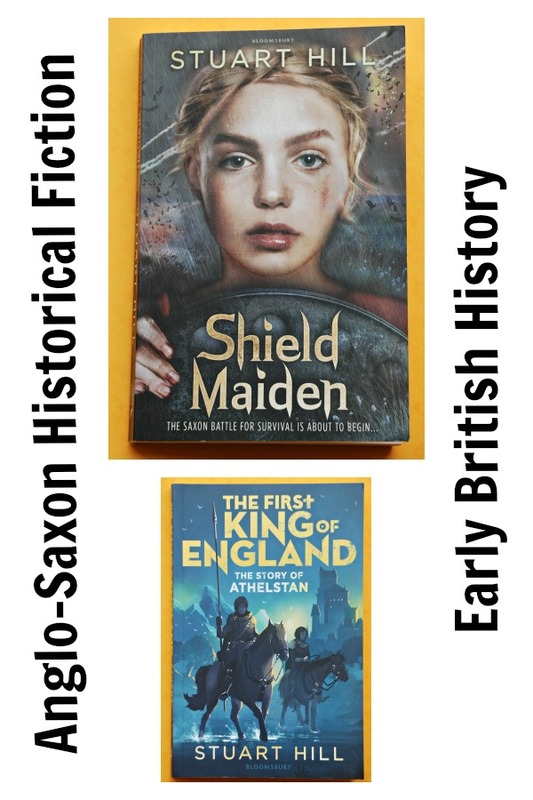 We have read a few Anglo-Saxon historical fiction books lately, every one has highlighted different aspects of that time and they seem to keep adding more and more to our knowledge and understanding of that time period. Our latest have focused on two key figures – Aethelflaed, King Alfred’s daughter who was known as a fierce fighter and was called Lady of the Mercians and then King Athelstan (King Aflred’s grandson) who was the first King to rule over both Wessex and Mercia and who actually established the borders of England way back in 937 AD. They are two separate books but we think they go well together – Athelstan is Aethelflaed’s nephew and the author has linked the two books with reference to a few key characters in both, however you could also choose to read them on their own. We started with Shield Maiden (Flashbacks) . My daughter was gripped by this story from the very beginning. The story begins with the Royal family of Wessex (King Alfred’s family) who are attacked by the Danes and they flee into the outskirts – the marshlands – where they regroup and then launch their attacks, eventually taking back control. So there is more fighting in this one compared to the other stories we have read. But the fighting scenes did not upset my daughter, in fact she hardly spoke about the fights, although she has admitted that she has learnt quite a bit about what it would have been like in an Anglo-Saxon battle of that time. She loved the fact that this was a story about a strong female character – someone who learnt to fight as well as her brother and went into battle to protect her country but at the same time you see this other side of her, the gentler side. I think reading books with characters like this is powerful for young girls – they can see women who are strong but can still be kind and caring. She also found the whole Pagan vs Christianity idea very interesting. The Anglo-Saxons were historically Pagans but then they converted to Christianity. What really resonated with her was the concept that just because a ruling power declares that the people need to follow a certain religion does not mean that everyone will oblige and that even those who “follow” may not truly believe it. And she even compared this to the Tudor times when the rulers kept flipping between Catholicism and Protestantism. In the book the Royal Children have a nurse Ara – who is clearly a Pagan wise-women. And what struck my daughter was the fact the King and Queen knew and even though they expected their children to follow christianity they very clearly respected Ara and her beliefs, they trusted her to protect their children – this was something we discussed at great lengths – how you can believe different things but still be respectful of what others belief. However my daughter did find it unkind when King Alfred had a church built on the Marshlands after his victory. She pointed out that he was happy to take refuge from the Marshpeople (who were pagans), accept their help and protection but when he no longer needed it he disrespected them by imposing a church on their ground – again something that sparked a lot of discussion. I did find it interesting that this theme resonated so much with my daughter but thinking about what life would have been like back then I am sure it would have been something very topical as people do not just change their belief systems over night. After Shield Maiden (Flashbacks) we went onto The First King of England: The Story of Athelstan (Flashbacks) . And like I mentioned I do think they work well together as the main character of Shield Maiden – Aethelflaed is also in this book, as is Ara (the pagan nurse although in this story she is more a ghostly figure of protection) and key places discussed in Shield Maiden are also discussed in The First King of England. This book follows a young servant boy Edwin who mistakenly picks a fight with another young boy his age only to realise it is the prince of Wessex. However it turns out the Prince is a not your typical royal and invites Edwin to be is a personal servant. So Edwin has to start following the Prince around which means we get a very close up account of all the events as they unfold – the training, the battles that are fought, and the peace that is sought from the invading parties. This story really does describe a lot of what living in those times must have been like – the clothes, the food, how they trained for battle, how they fought, the fact most people were focused on just surviving, that even in times of peace people were constantly waiting for the next battle. For us one of the key themes that came through was that feeling of guilt, of sorrow after a battle, knowing you had to kill or be killed but still feeling bad for those who died and the uncertainty that someone could invade at any time. My daughter kept commenting about that uncertainty and that a peace treaty did not really mean that much. She also loved the section where the Prince of Wessex releases a Viking Prince. She liked seeing that even in those time of uncertainty and violence people could still put aside their differences to be kind. We really enjoyed both of these stories and I can honestly say that after reading them my daughter has a better understanding of what life was like in the Anglo-Saxon times. This entry was posted in History and tagged Anglo-Saxons, British History, children's book, History, home ed, home education, homeschooling. Bookmark the permalink.